Emerging during a period of rapid and intersecting Web design and digital marketing growth, the role of digital project manager (DPM) is the newest player in the project management field. Companies in fast-paced, Web-centric industries seek professionals in this role to lead initiatives that will help them keep pace with the competition. Software Advice recently published a study analyzing 300 project manager job listings to help job seekers understand the professional requirements of this role. As a follow-up to that report, we conducted another study—this time with a focus on DPMs. To learn what employers seek most in DPM applicants, we analyzed 200 job listings from Indeed.com. This report outlines our most important findings. 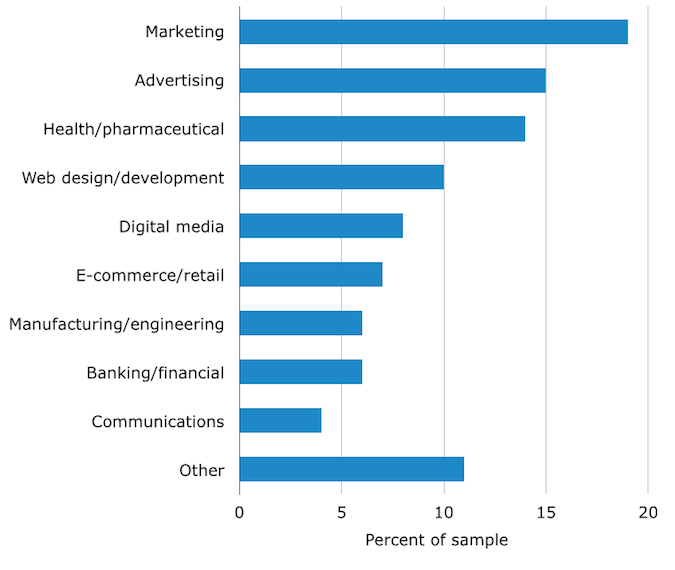 A majority of employers (58 percent) prefer or require candidates to have a higher education degree; business and marketing are the two most requested areas of study. The most common prerequisite is a specific number of years’ professional experience, with 77 percent of listings requiring anywhere from 1-10 years of experience. Seventy-three percent of employers require specific technical skills, with Web programming and application development the most preferred (29 percent). 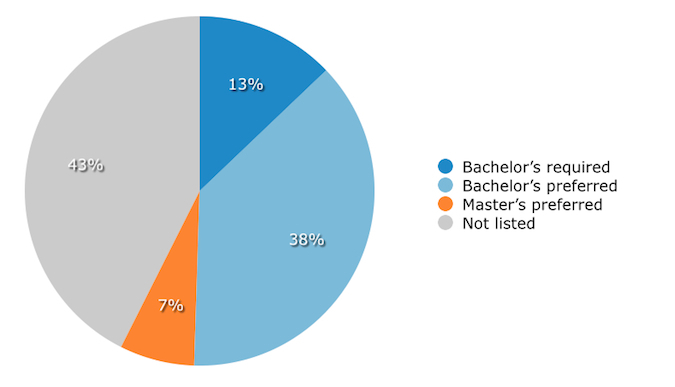 Of the 200 listings we analyzed for this report, 13 percent preferred a bachelor's degree, 38 percent required a bachelor's degree and 7 percent preferred a master's degree. Forty-three percent did not mention higher education. Chart values have been rounded to the nearest whole number. A more detailed picture emerged when we drilled into which academic concentrations were most attractive to hiring managers. Of job listings that mentioned higher education, business and marketing degrees were the most sought-after, cited in 18 percent of listings. Technical, information technology (IT) and information systems (IS) degrees were cited in 15 percent, while computer science accounted for 14 percent of mentions. The most cited prerequisite by employers in our sample was specific amount of professional experience: 77 percent of listings preferred or required anywhere from 1-10 years’ experience. Somewhat surprisingly, just three to four years’ experience was the most common duration listed, cited in 36 percent of job listings. “[To enter digital project management,] it's not as much what you need to know as what you need to be curious about,” explains Shannon Moorman, vice president of talent acquisition at GSD&M, an advertising agency that represents brands like Southwest and Chipotle. Drilling deeper into the data, 78 percent of all listings required or preferred industry-specific experience. 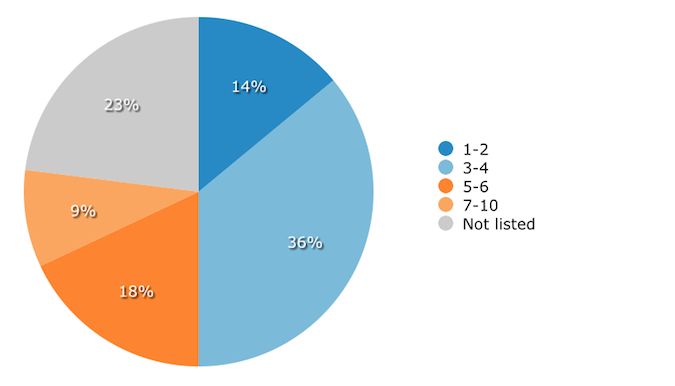 When we broke the listings down by industry, we found that marketing and advertising were most likely to cite this prerequisite, with each accounting for 19 and 15 percent of listings, respectively. “While digital project management often involves people doing technical work, it’s ultimately intended to accomplish marketing business goals,” Karl Sakas, founder of Agency Firebox, explains of this finding. He points to several marketing-specific responsibilities that often require the expertise of a DPM, including website management, social media campaigns, pay-per-click campaigns, search engine optimization and video production. “If a DPM understands marketing, they're going to have a better understanding of what the overall project will accomplish, and they’ll be in a good position to understand both the technical and business aspects of projects,” he adds. Project management professionals entering the digital arena must demonstrate considerable chops across many areas, including analytics and reporting, project management and the use of content management systems. Tech proficiency is especially important, from digital animation to Web application development and more. 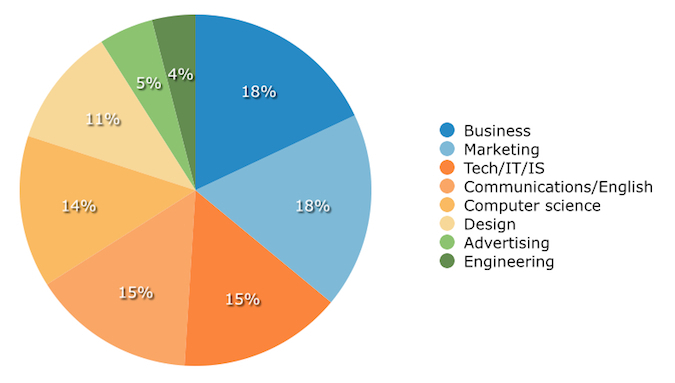 Given this, it’s not surprising that 75 percent of job listings in our sample sought applicants with technical skills. 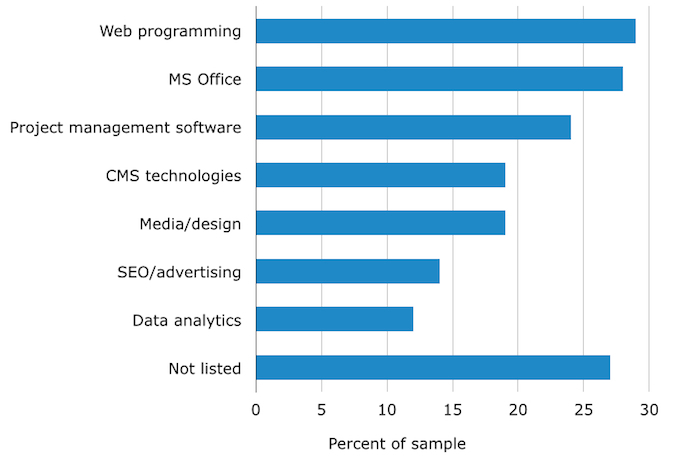 Web programming/application development was the most-requested skill (29 percent of listings), followed by Microsoft (MS) Office (28 percent) and project management software (24 percent). As applicants consider investing in technical training to complement their other qualifications, this data will be useful in prioritizing which programs may be the most worthwhile. 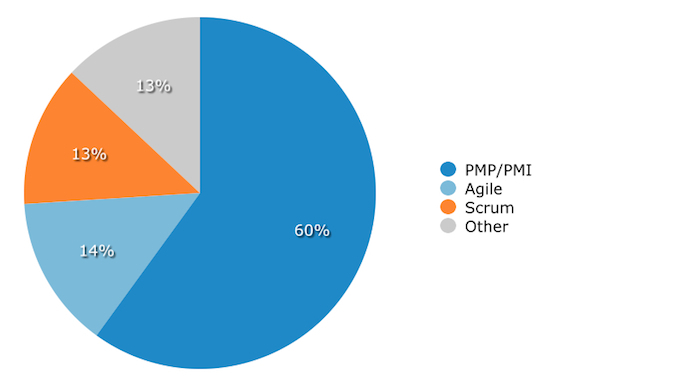 Moving onto other required skills for the DPM role, we were surprised to find that only a fifth of the listings we analyzed stated a preference for candidates with a project management certification. Of the 20 percent of listings that did prefer or require certification, the most commonly represented were the Project Management Professional Certification (PMP) through the Project Management Institute (PMI), as well as Agile and SCRUM. 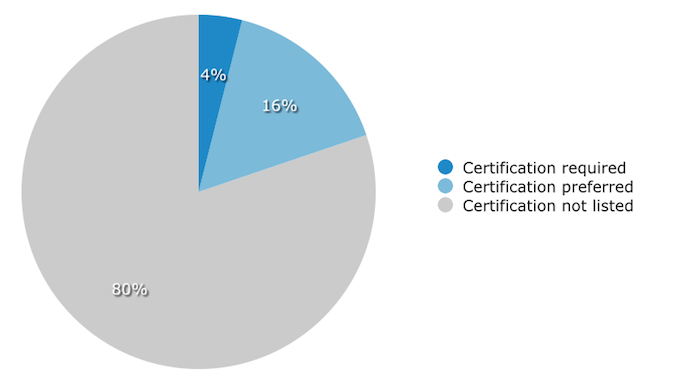 Edgerton attributed the lack of emphasis on certifications in our sample to the relative size of digital projects within a company's operations. “Digital projects as a whole are a little smaller in scale, so something more lightweight [than a PM certification] is more often called for,” he explains. While he describes a certification as “another tool in [an applicant's] tool belt,” Edgerton also notes that it can be a negative if an applicant clings too strongly to the certification as part of their identity. Candidates with a PM certification should thus keep this in mind, and be sure not to overemphasize this in lieu of highlighting other desirable qualifications. An important factor in considering any position, of course, is location. 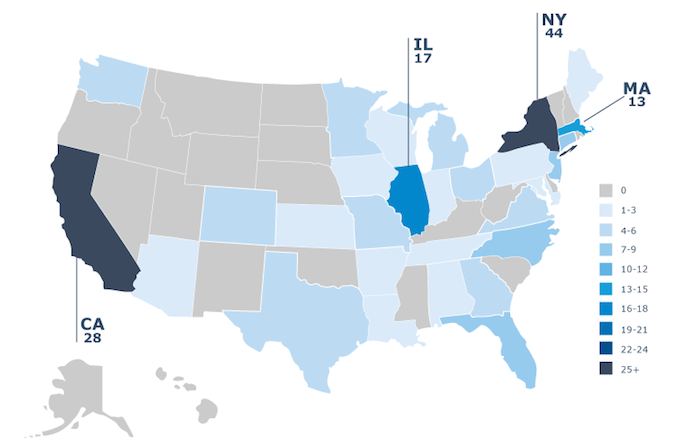 The listings we analyzed showed clear geographic concentrations: over a fifth (22 percent) were located in New York, while 14 percent were in California. Meanwhile, 9 percent were located in Illinois, and 7 percent were in Massachusetts. No other state represented more than 5 percent of listings. Companies included in our analysis were spread across a wide variety of industries. 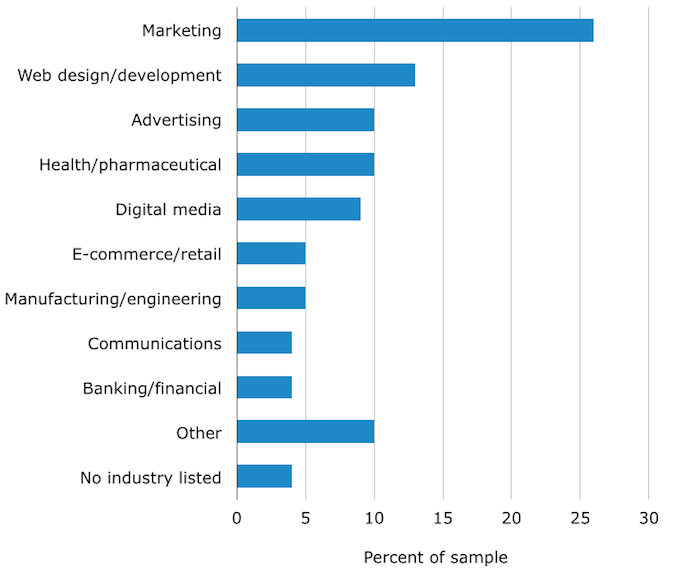 Marketing was by far the most prevalent, accounting for 26 percent. Close behind were Web design/development (13 percent), advertising (10 percent) and the health/pharmaceutical industry (10 percent). While a higher education degree (particularly in marketing or business) will strengthen an applicant’s chances of landing a DPM role, our analysis suggests that several years' professional experience, particularly that which is industry-relevant, is a greater qualifier for this position. The most competitive candidates will have backgrounds that incorporate business, technology, communications and design. They will also be versed in programming and development, and will demonstrate flexibility across technical platforms. That being said, those candidates with less impressive backgrounds should not discount themselves. This report was compiled from an analysis of 200 national job listings from Indeed.com. A search for “digital project manager” accounted for 169 listings; “Web project manager” accounted for 86 and “online project manager” accounted for seven, giving us over 200 listings to work with. Some listings were excluded due to duplication, listing expiration, unusable or irrelevant data etc. To further discuss this report, or to obtain access to any of the charts above, please contact noelradley@softwareadvice.com.